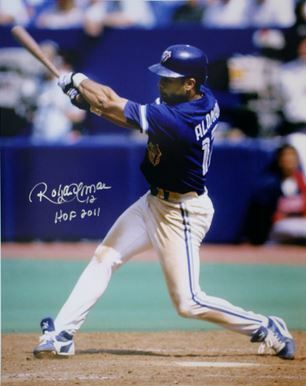 Roberto Alomar cards and autographed memorabilia have remained popular with collectors long after his retirement in 2004. He played for seven teams during his big league career but was the first inducted into the Baseball Hall of Fame as a member of the Toronto Blue Jay. Alomar won two World Series titles while with Toronto. His resume reflects his Hall of Fame status. He was an All-Star 12-times and won ten Gold Glove awards. He finished his career with a lifetime batting average of .300, while racking up 2,724 hits, 1,134 runs batted in and 474 stolen bases. 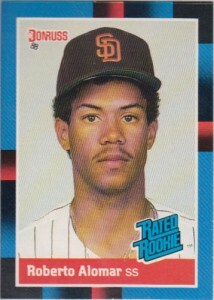 Roberto Alomar has five rookie cards, three of which can be found in end-of-season update factory. Alomar also has two minor league cards, 1987 Texas League All-Stars set 1987 Wichita Pilots, a team-issue card. Alomar's first certified autograph card is part of the 1992 Donruss McDonald's set. Available in Canadian restaurants, it was a prize for a massive baseball card promotion. One of his most popular, early autograph cards is from 1996 Leaf Signature Series. The base version of the card has a print run of 700. Two parallels, Gold and Silver, have print runs of 100 and 200 respectively. The first Roberto Alomar game-used memorabilia card was produced by Upper Deck in 1998. It is a Piece of the Action insert card. The card is not serial numbered but has a disclosed print run of 225 total copies. 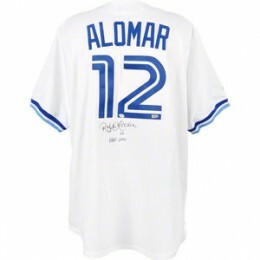 Roberto Alomar's autographed memorabilia has seen relatively consistent demand. He was a fan favorite wherever he played and was often a willing in-person signer. He does participate in the occasional autograph signing event. Unfortunately for collectors, the 1988 Donruss Baseball set was one of the most over-produced products in trading card history. As a result, Alomar's rookie card has very little value. On the plus side, it doesn't cost very much to acquire a rookie card of a Hall of Fame player. Even when professionally graded and earning top marks, the card receives only a slight increase in value. The Leaf version of the card features the same design but with a different brand logo. Aimed at the Canadian market, it is believed that the Leaf card may have had a smaller print run. Still, it is not enough to add a premium. 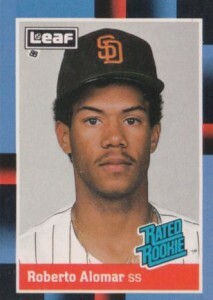 Fleer recognized Alomar as being a significant rookie. While they missed getting him in the main 1988 Fleer Baseball set, they didn't overlook the second baseman for their Update set. The card can also be found with a Glossy version that was available in a special factory set. 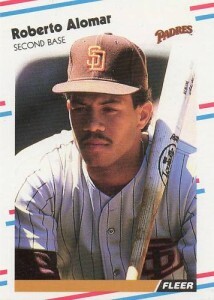 This is thought to be one of Alomar's shorter printed rookie cards. Score also released a glossy version of the set. 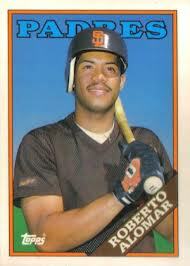 The card from that set has a stated print run of 3,000 and is the rarest first-year Roberto Alomar card. 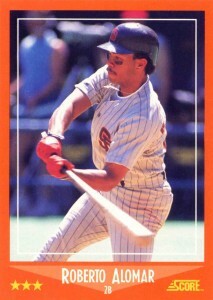 Because of the loyal brand following the flagship Topps set has, this is one of Alomar's most popular rookie cards. He also has a card in the glossy Tiffany set. Roberto Alomar Mitchell & Ness Toronto Blue Jays Jersey! Small 36! Used! 1989 - Fleer - Roberto Alomar - GRADED GEM MINT 10!!! 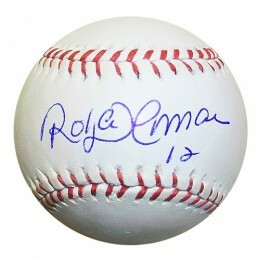 Below you will find an example of what Roberto Alomar's authentic signature looks like. This can be used as a first point of reference for determining the legitimacy of autograph memorabilia, but is not a substitute for having your items authenticated by a well-respected professional autograph authentication company. Some of the trusted sources within the sports memorabilia market include the following companies: PSA, JSA, Steiner, Mounted Memories and Tristar. Click on any of the images below to view full size photos. It is a unique signature with several of the letters being hard to distinguish. It is written on an even horizontal plane. The "R" is written in a manner where it often does not form a closed loop. The vertical line is very short, The angled line often extend well to the right. The "o" is clearly legible. The "b" is somwhat implied by a vertical line. The "e" displays no opening. The remaining letters of the first name are not discernible. The center of the signature shows two lines looking like opposing parenthesis ")(". This is the "A." The right portion is also used to form the "l."
The letters "m-a-r" are clearly legible.